Megyn Kelly declines to respond to Donald Trump: Here's why that's great for Fox News. 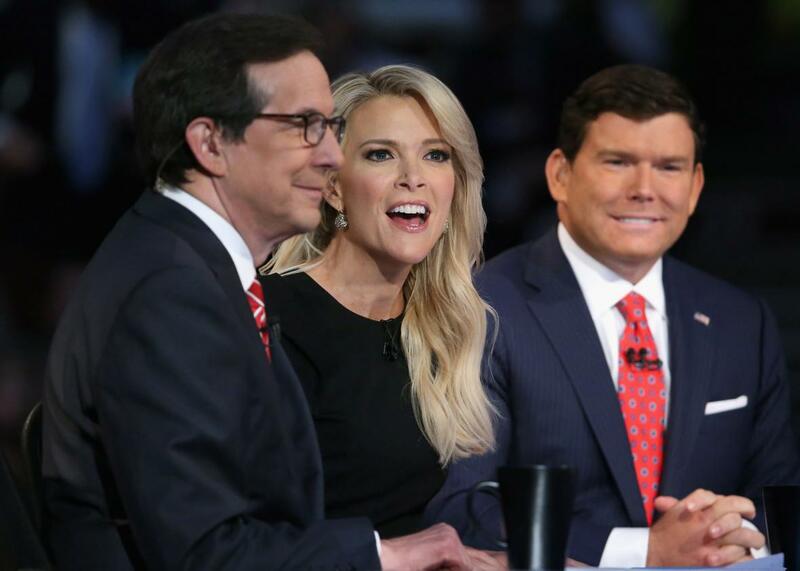 A feud that began at last Thursday’s Republican debate ended Monday on Megyn Kelly’s Fox News program. One thing that’s not over on Fox News: The Trump Show. What happened, obviously, is that Trump made Kelly’s menstrual cycle a topic of national conversation. Trump, who took offense to some of Kelly’s questions during Thursday night’s Republican presidential candidate debate, told CNN’s Don Lemon on Friday that “you could see there was blood coming out of her eyes. Blood coming out of her wherever.” Since then, the second half of that quote has been interpreted as a sexist reference to Kelly being on her period—Trump disputes this—and Trump’s remarks have been repudiated by many in the Republican establishment. While Kelly was surely right to choose not to respond to the Trump, the “let’s get back to the news” exhortation seems a bit hollow given the extent to which her network and others have made Trump the news. Fox News and its competitors cover the candidate’s every boorish proclamation as if they were serious statements made by a serious person, as opposed to the asinine vulgarities of a stunt candidate who, history suggests, has no chance of winning his party’s nomination, let alone the general election in November 2016. Yes, Trump is leading the polls right now. But it is the middle of the summer in 2015, and leading the polls right now means very little. In 2011, Herman Cain was for a time the GOP presidential front-runner. In 1996, Steve Forbes and Pat Buchanan were early favorites. Blusterers and businessmen tend to do well early on in presidential campaigns, but they inevitably lose their luster. In reference to Trump, “Let’s get back to the news” ought to mean recalibrating the network’s campaign coverage to focus on issues and substance. And indeed, Kelly may wish to move on from any coverage of Trump entirely. But for her network, “let’s get back to the news” might as well mean, “let’s get back to treating Trump as a viable candidate for some reason.” Fox News made peace with Trump Monday, with Fox News chairman Roger Ailes calling the candidate on the telephone. Interviews on the network are scheduled for Tuesday. Fox News has certainly made the Trump-Kelly feud into news, but now it’s in the network’s interest for Kelly to move on. As long as Trump is the top dog in the polls—and presumably among a big chunk of Fox News viewers—the network can’t afford to appear too hostile toward him, especially after its aggressive treatment of him last Thursday only pushed his numbers up further. Conversely, any Republican front-runner who feuds with Fox News risks losing that front-runner status quickly, which is why it makes sense for Trump to make peace with Fox. Kelly, meanwhile, gets to burnish her own brand by being above the fray; her even-tempered response to Trump will just serve to cement her reputation as one of the network’s most reasonable—and most marketable—stars. While taking the high road is the dignified choice, I personally would have liked to have seen Kelly be as hard on Trump as she was on the Ferguson protesters during the rest of her show. While Kelly and her fellow moderators’ tough, useful questioning of Trump during last Thursday’s debate made for good TV, it’s clearly not profitable for Fox News to feud with Donald Trump; Roger Ailes doesn’t deliver personal phone calls lightly. Feuding with the “black lives matter” protesters is another story. Immediately after her opening statement, Kelly turned to Ferguson, Missouri, and the protests that have begun again there in recent days. Her guest was former Los Angeles police officer and convicted felon Mark Furhman, who has been caught on audiotape using racial slurs. If that’s what “let’s get back to the news” means, then I, for one, might prefer to stick with insult comedy.